Many of us know the feeling– you jump in a vehicle, but nothing happens when you turn the key. No sputtering, revving or cranking… the telltale signs of what is usually just a dead battery. Batteries are not hard to replace or maintain. If you know how to open a hood, turn a wrench and follow instructions safely: you know how to replace a battery! Maintenance requires little more than ensuring electrical devices are turned off and limiting your vehicle’s exposure to extreme weather. Read on for Park Muffler’s crash course about your vehicle’s battery! Batteries create electricity through a process of a chemical reaction. 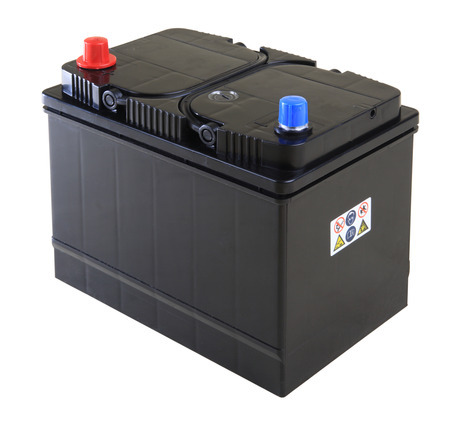 Typical automotive batteries run on a lead-acid reaction, using lead poles and a solution of water and sulfuric acid. When you turn a key in an ignition, it sends a signal to the battery to begin this chemical reaction. The resulting electrical charge, in turn, fires the starter– all of which brings your vehicle roaring to life. Once running, all necessary electricity is sourced from a running device known as an alternator (which also recharges the battery). This system allows your vehicle to start and stop seamlessly everyday for 3 to 5 years, even in moderately cold or hot weather. Contact or visit Park Muffler today if you have any questions or doubts about your vehicle’s battery. Why is a battery important? It’s safe to say that most people know batteries create electricity, but you may not know just how many vehicle components rely on an electric charge to work. As vehicles become more and more automated, a reliable electrical system is essential. From your ignition right down to the turn signals, your vehicle relies on the initial boost and constant charge provided by a functioning battery and electrical system. Additionally, batteries can be dangerous if misused or mistreated– always invest in a new, high quality option recommended by a trusted tech like the ones here at Park Muffler. You should have your vehicle’s battery tested semi-regularly, keeping track of any changes in your vehicle’s performance. Try to avoid extreme weather as it can wear out even a new battery, which can significantly reduce its lifetime. Should the worst happen, always run your vehicle for at least 30 minutes after a boost so your alternator can properly recharge the battery. If you have any other worries, concerns or questions about battery maintenance, the experts at Park Muffler are standing by!